Each year Classic Tuxedos & Suits works with local students from each area school to help spread the word on HUGE rental savings! Our Prom Reps will receive a special gift, be entered into a drawing for additional prizes, and have an opportunity to earn a FREE tux rental, and/or a FREE suit, plus cash and prizes! Our team of prom reps get an opportunity to let their peers know about our in stock inventory, major savings, award winning customer service, and much, much more. 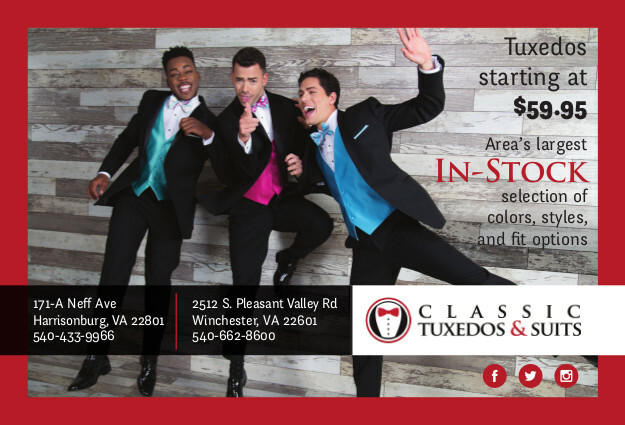 When it comes to shopping for your prom outfit, there are a lot of choices out there, but the staff at Classic Tuxedos & suits are able to help you with all of those decisions, and can save you lots of cash to help you pay for corsages, dinners, and limos for your big night. Prom Reps help explain the difference between ordering from a catalog, and picking out an in stock style, and how that process can make your prom go much smoother! Reps also get an opportunity to wear a tux to school to hand out discount cards and information to their friends. This can be lots of fun as a chance to mix up some styles (especially if you have a look you really want to wear, but your date won’t let you wear it on the big night!). Earn more FREE stuff by helping out more. Going to a track meet, football game, soccer tournament, or any other gathering with your fellow students? Bring your Prom Rep cards, and hand them out there! See friends from other schools? Give them some cards too! Every card counts towards your tux, cash prizes, and more! See us to find out how to become a Prom Rep and help your classmates save $45 off of our already low prices, earn a FREE tux rental, get entered to win free stuff, earn cash, and even a FREE suit!